Sweet summer corn lightly coated with lime infused mayonnaise, a touch of hot chili powder and cojita cheese. 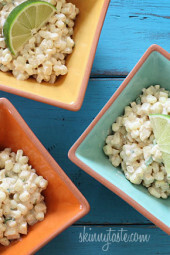 Also known as the Mexican street corn salad, elote. Inspired by a very popular Mexican street food called elote, a typical street food of grilled corn, smothered with mayonnaise and topped with shredded cojita cheese and chili powder. It’s simply addicting and combines the flavor sensations of sweet, spicy, sour and savory. Here in New York, you can find vendors in Hispanic neighborhoods on busy street corners grilling corn and serving this special treat. There’s a heat wave in New York this week, so I skipped the grill and cooked the sweet corn on the stove just a few minutes. I added some fresh scallion and cilantro for color and flavor and loved this as a side dish. Cotija cheese is a firm, dry Mexican cheese similar to a feta, which could be used in it’s place if you can’t find it near you. Side note: Don’t you love my turquoise table? It’s actually not a table, this was a board made just for me from my crafty friend Tricia over at Crafty Moods. If you have a blog and want to learn how to make these beautiful boards, visit her site and she walks you through it step by step! Boil corn in boiling water for 5 minutes, remove from heat. In a large bowl combine mayonnaise, yogurt, chili powder, and lime juice; mix well. Add corn, cilantro, scallions and cheese and toss. This was amazing —- any idea what the points are on Freestyle? 4, all the Smart point values have been updated to reflect the Freestyle program. Made this last night and it was delicious! Curious to know if the leftovers could be frozen? Made this for dinner last night as a side to the late summer vegetable enchilada pie. Both were a huge hit! My husband couldn’t stop raving about this side dish. I have made this 4 times and have eaten it hot and cold- doesn’t matter! It’s AMAZING!!! This is a fantastic side dish or snack at work, was quite good with the feta. Help! I made this tonight, followed the recipe word for word and it came out really gritty, not creamy like it looks in the picture. Any thoughts on what I did wrong? It has a nice flavor, but the texture is kind of gross. Hmmm… Strange. Mine isn't gritty at all. Maybe it's a problem with your corn? Maybe you had dirt in it? Bummer. I made this last Summer and it was awesome! Now corn is back in season and I can't wait to make it again!! I love this! I accidentally bought Queso Fresco instead of Cotija cheese so I used shredded parm. 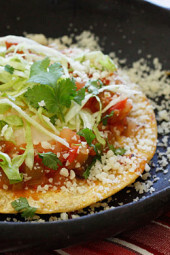 Could I use goat cheese instead of Cotija? Anything salty, feta would be good. I have made this over and over again for my family and the quadrupled batch that I made for a Boy Scout potluck disappeared within 25 minutes! One time I didn't have corn on hand but I had some summer squash, zucchini and patty pan so I cut them up into little corn sized bites, cooked them in a nonstick pan with a little olive oil and did the rest of the recipe as listed and it turned out to be also very yummy! Just made this tonight. I used crumbled feta instead of the other cheese. You did not put a warning on it though that I would eat the WHOLE THING! Hahah. It was awesome. I just ate it straight out of the mixing bowl, which was probably a part of my problem. Living in LA, we LOVE Elotes! Even Elotes en Vaso. Made a variation with leftover taziki sauce. Still delish! I was really surprised when I made this tonight that I didn't really like it. I don't know what it was, but it didn't have much flavor to me. Maybe I should have added more chili powder. This recipe is just amazing, even my kids/ Toddlers love it. I am obliged to make it for the hubby, It is fun making , eating and digesting. Thanks for sharing, i have made it three times so far. a lil more lime is great. Great for a potluck idea. Thanks a bunch, LOVE LOVE this site. Thank you for the recipe! It was so good!!! We first tried this dish at a restaurant in Sedona called Elote and fell in love with it. I made it last week with your recipe and it was nirvana. Picked up more fresh corn last night to make it again. I think we'll be having this often this summer. Pinned it, so I can find it easily. Thanks so much! I have tried about 15-20 of your recipes and this one is definitely in my top 5! keep on dishin them out Gina, your blog is and has been a favorite of mine for over 2 years now. This was SO good, even better than I expected. I made the recipe exactly as you wrote it, I never go wrong with your recipes!! I made this tonight and it was delicious!! I used frozen corn (sweet white & yellow), omitted the cilantro (I'm not a fan), doubled up on the chili powder and added some cayenne (I was craving something with heat), substituted crumbled fat-free feta for the cotija, and used the juice of an entire lime. Will definitely make this again! I made this as a side dish today, and everyone raved about it. I'm so glad I doubled the recipe! I had never used cotija cheese before, and found it to be delicious. This recipe is definitely a keeper! Thank you Gina! I made this for a potluck dinner at Church on Sunday. Everyone loved it! I came home with an empty bowl. I had to use Parmesan since I couldn't find the cotija. Thanks for sharing this recipe! I just made this for a picnic, and of course had to sample…YUMMY!!! I couldn't find the cotija cheese, so I used feta instead. Absolutely delicious! I can't wait to hear the reactions at the picnic tomorrow! I will be making this for the 4th of July. Looks wonderful! I've seen the cotija cheese at Walmart before, but never purchased it. I'm heading out now to get all the ingredients. I did find the cotija cheese at Walmart. It's in a cellophane bag, and crumbled/grated. I tasted it, and it's very similar to Parmesan. 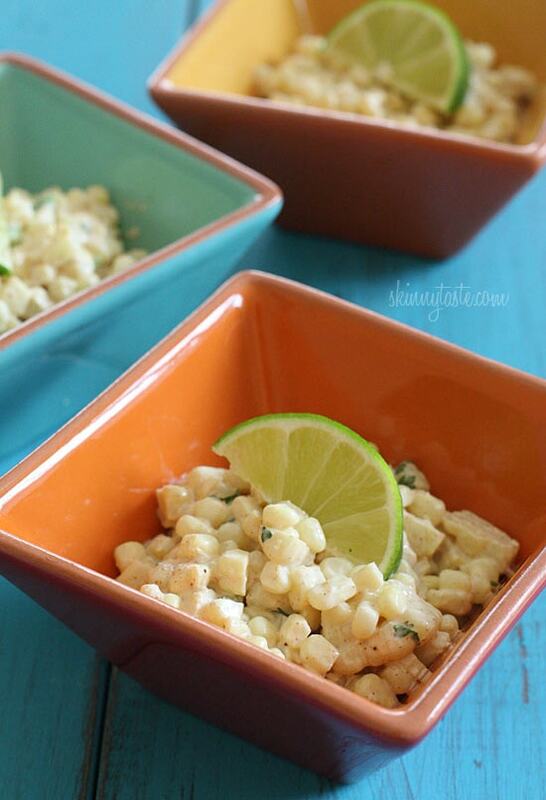 One tip… if you do have the time, grilling the corn adds some great additional flavor! PS. I was introduced to you through my sister and your no bake cheesecake – YUM! Amazing. I can't stop making this. I shared it with two friends who thought it was delicious. I love it served cold. I have been searching for a recipe for this after having it in a restaurant. Thank you! I am looking forward to trying this. Looks easy and that is what I like with a little 'zing' added! I'm making a big batch of this tonight and plan to bring it to a potluck tomorrow. Should I try to re-heat it to 'warm' or just serve it cold? Well, I made a triple batch! That took a lot of work LOL. I accidentally bought (and used) mayonnaise dressing instead of normal mayonnaise, so I think it came out sweeter than it was supposed to. Regardless, I love it! I put it on top of my chicken last night.. Mmm mmm. I'm taking it to the potluck tonight; I hope I have leftovers! Just finished eating this! It was delicious!!!! Definitely going to make this often. I'm thinking it would even make it in the winter with frozen corn. The husband loved it. Thanks for another fabulous recipe!!!!! I just made this salad for a BBQ on Saturday….it was a HUGE hit!! Thanks for all the great recipes! This is money! Made it for lunch today. Very delicious. This was fantastic! I'd never heard of this dish before, but you've never steered me wrong before, so I had to give it a try. So glad I did; this will have to become a weekly side dish this summer 🙂 Just hit my goal weight (35 pounds lost altogether), and your website has been a huge process of that—thank you, Gina! I made this for a pot luck today & I'm sure it's gonna be a hit! My sister and I just tried it & are hoping for leftovers, but I'm pretty sure there won't be any. It's so good! What would go great with this would be some skinny chicken flautas. They are a welcome change to tiresome fajitas and tacos, and delicate flavors of peppers really set them apart. I've see some baked and healthy versions of greasy morsels of awesome, but they lack flavor and end up being chicken tacos rolled in tortilla chips by the time the oven dries them out. Just throwing it out there as a new recipe for you to makeover, Im sure they'd be a hit! I'm mexican and have this all the time. It's so good and definitely addicting. I usually do a fat free sour creme rather than yogurt though. Cheese and corn? How can I resist?! This mexican dish is call ESQUITES, when we boil the elote (corn) we add epazote leafs and salt. 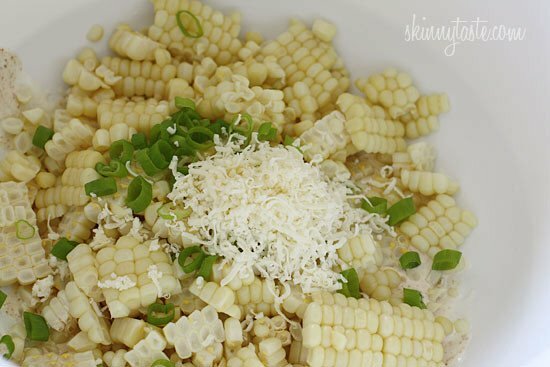 To serve you put the corn grains with the hot broth, mayo, chili, cheese and lemon juice. So delicious!!!! Awesome! Thanks for sharing Ruby!! Sounds delicious. Now to search your site to find something to serve with it. Love this! Perfect summer salad! My daughter-in-law is Mexican so I can't wait to make this for her. I know she will be so surprised. If you don't want to grill the corn or heat up your kitchen you can put the cleaned ears of corn in a gallon-sized zippered plastic bag and microwave for 6 minutes. Perfect corn everytime and so much tastier than boiled corn. Even easier is put the whole ear of corn in the microwave without shucking it for 4 minutes. Cut off the bottom of the corn making sure to get all of the base and flip over and the corn will just fall out. No silks or anything. I saw a YouTube video and had to try it…works perfectly! Yum! I do a dish kind of like yours, but I smear all the goodness on the cob of corn than grill it. I love your idea and addition of cheese!! Sounds amazing. Do you serve it hot or cold? Oh I'm so silly, I just saw the title 🙂 Different question: does it taste bad served cold? This is great! I've grown up being able to buy from the vendors, but it was always a problem of having to explain, no I don't actually want the mayo on the corn, just everything else, and this takes care of that problem. 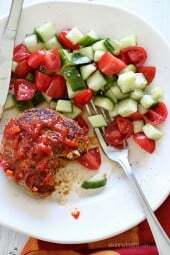 I made this without mayo or yogurt and it was delicious! what could I use in place of that? Leave it out, drizzle a little olive oil. That looks so delicious and so summery fresh. Definitely a must try! In Chicago (at least on the south side) they use grated parmesan cheese, I think it tastes wonderful. 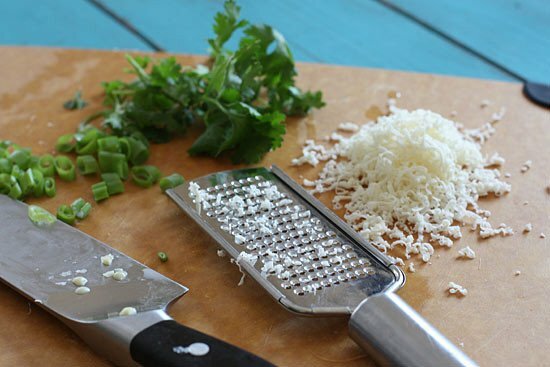 So, if you have trouble finding cotija and need a substitute, grated parmesan has similar calories/fat. Yup! Parmesan is fine too! I saw the heading, and yelled "ELOTE"! My dh thought I was losing my mind. Lol. This is one of my faves. 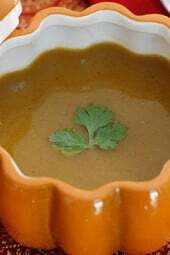 Love the healthier version, I only have my family's traditional recipe. Yay! Can't wait to make it. any idea how much corn "4 large fresh cobs" gives you? I plan on making this with canned corn but I need to know how much to use, to go with the rest of the ingredients. Thanks! Yes, this looks amazing. but like teh bloggers above – do you think there is a mayo alternative?? I hate mayo! OH MY GOODNESS! We just moved to Dallas from North Carolina and have fallen in love/obsession with elote!!! But it's not figure-friendly. I am SO excited you posted this recipe. So excited, in fact, that I just called my husband at work and told him about it. THANK YOU! Can this be made without the mayonnaise and just double the yogurt? 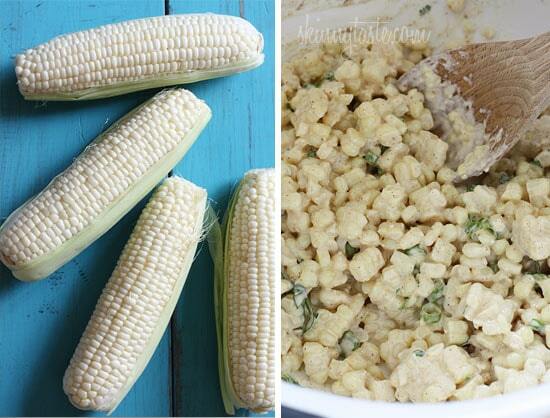 cannot wait to make this…elote is amazing! What a great idea! I love Mexican corn but it never occurred to me (duh!) to serve it like this. So much easier and way less messy! What could be used to substitute the Mayo? any ideas?? I am dislike it too much-but think this recipe looks amazing! Try fat free sour cream in place of the mayo. It will taste a little different, but will still be good! Our son loves elote but the tradiional recipe has way too many caloroes. Can't wait to try this one. This sounds so summery and refreshing! Definitely adding to my "to make" list! Quick question we're stationed in germany & i never really see fresh corn on the cob in our commissary so should i use canned corn or frozen corn on the cob??? It says 4 cups in the directions. I prefer frozen over canned personally. Can I use frozen corn for this dish instead? I hate mayo (I'm weird, I know) so when I make this (and I plan on making it this weekend) I think I'll just use all yogurt. This looks amazing! Wow, what are the chances that I have all the ingredients (except the corn) in the house right now…..I think I'm making this to go with fish tonight for dinner! Made it for dinner. Very very tasty! Will be making this again. I cheated and used frozen corn but it was still gooooooood. this recipes looks great. My one question is where do you buy the cheese? I found it in Pathmark, but Feta would work too. Of the three grocery stores I frequent, they all randomly carry the Cotija cheese- it's a total crap shoot whether they will have it or not. Whole Foods usually does though, and Ricotta Salata is a very good substitute as well as the feta. It's a little drier than feta. 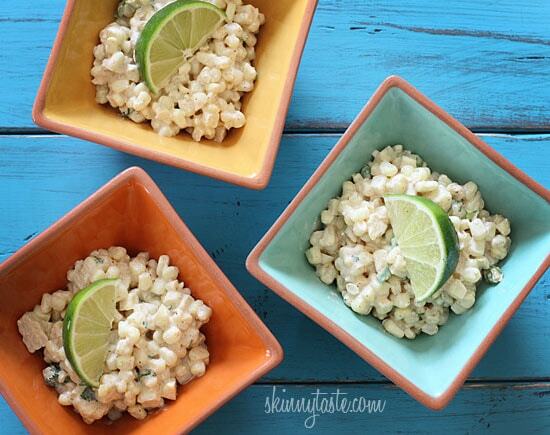 I am obsessed with this type of corn and will definitely be trying this healthy version. Hi! Do you have a substitute for the cheese, as I know I probably won't be able to find the Cotija. I LOOOVE Feta cheese but can't have it right now because I am pregnant, (know I need to avoid mould-ripened soft cheeses) any suggestions on a different type of cheese? Cojita is also typically on the do not eat list of cheeses during pregnancy. I'd maybe try Parmesan for a substitute. I substitued Gruyere and it was delicious. My regular Kroger grocery store ALWAYS has Cotija, and we use it instead of feta. It is milder and saltier in flavor and WE LOVE IT!! I wouldn't skip it unless you have to! If you have an aisle with Mexican food and it has a cooler in the aisle, check for Cotija there. Hey, great minds…I just made this too, and on the stove-top! Your photos are great! I love the "table" and aqua is my favorite color. I was talking to a crafty friend of mine to make one for me. 🙂 I do like your recipes! omg this looks so good! I think it will be dinner tomorrow! Thanks for the tip on the board. Great idea! The recipe also looks pretty darn good! That board is such a great idea. It's a built-in pop of color! This sounds so good, I can't wait to try it! ooooh! I love this! It's "the corn-man" in a bowl! I'm moving from a highly Latino area with a corn-man to an area that I don't think would take kindly to him. 🙁 I was thinking of how much I would miss him, but now I feel like I won't have to! My husband will love this. Thanks for the recipe! And now, I know I'm one of those people who isn't actually reviewing the recipe… Sorry all. I will, I promise! This is DELICIOUS. I got the cheese at the Mexican grocery store. This is such a great recipe!! Thanks so much for sharing!! I love this stuff. Thanks for the healthier recipe! Ever since my cousin's Mexican girlfriend made this for me a few years ago I haven't stopped thinking about it.